Popularly known because of her tasty and easy ‘30 Minute Meals’, Rachael Ray has seriously gone a long way since her first public appearance for her famed book. Now, it is reported that this renowned TV personality/ celebrity author and chef has a net worth amounting to $80 million. From her cooking books down to her television shows, it is off the hook to say that she is one of the most influential celebrity chefs in the world. 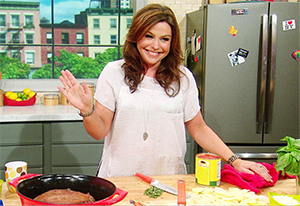 Born from a family with flair in cooking, Rachael Ray fall in love with cooking at a tender age. Her mother, in particular, was a restaurant manager in several areas in New York’s Capital District. When her family moved to New York, that’s when she started her career as a candy counter at Macy’s Marketplace. From then, she was able to administer Mister Brown’s Pub located on Lake George, by which she became a prominent buyer at Cown & Lobel. During these times, she noticed that many people are cash out money and time yet not an effort to cook something for themselves. So, she created a bold move of teaching people how to complete a recipe for just a limited time. Helping her attain her worldwide recognition was her quick and fast cooking recipes, which can be completed for only 30 minutes; hence, the name for her first ever cooking show on Food Network— ‘30 Minute Meals’. The hit food program run for 11 long seasons, from 2001 up to 2012. From there, she have become an instant celebrity, with some of her unique catchphrases being used significantly such as EVOO (extra virgin olive oil), ‘Oh my gravey!’, ‘yum-o’, and more. It is known that her specialty is burger, by which she created a a cook book seemingly devoted to her burger mania— Book of Burger. Her love for food opened a lot of doors for fame, and some of her own television shows are Rachael Ray and Rachael vs. Guy: Celebrity Cook-Off. And, she has appeared, either as a host or judge, on notable cooking shows like Food Network Star, The Best Thing I Ever Ate, The Chew, Cupcake Wars, Iron Chef America, and so much more. Not only that, she had her own magazine named ‘Every Day with Rachael Ray’ and even posed for a popular men’s magazine, FHM. And because of her works, she has been awarded with prestigious awards like Best Outstanding Talk Show, Daytime Emmy Awards for Best Outstanding Service Show. To date, you can still read her famous cookbooks including Rachael Ray’s Express Lane Meals, Yum-O! The Family Cookbook, Rachael Ray’s Book of 10: More Than 300 Recipes To Cook Every Day, My Year in Meals, Rachel Ray’s Look and Cook and the list continues. In 2005, she got married to John Cusimano— a musician and a lawyer.